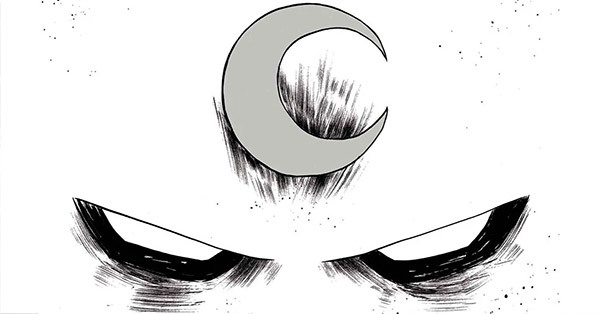 Today I updated the guide of one of my favorite Marvel characters, as evidenced by my wardrobe on recent episodes of Crushing Comics – The Definitive Guide to Moon Knight! This update was extra-fun because I love Moon Knight and any excuse to read his issues, but also because I got to correct some continuity confusion to better explain his chronology. Is this the first time you’ve ever heard of Moon Knight? Or, do you just need a recap before diving in to collecting his comics? Keep reading for an introduction, where the character has been in 2017, and one of my trusty recaps of just how much material you can actually buy in a physical collected edition. Moon Knight is an unusual Marvel hero who feels a lot more like a DC character in more ways than one. 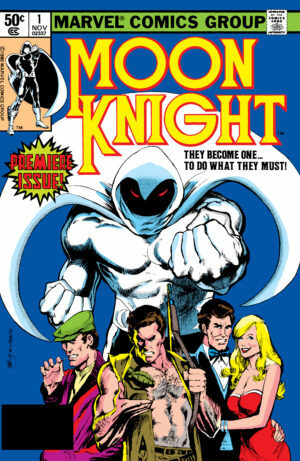 When Moon Knight was first introduced in 1975 by writer Doug Moench, it was as a lunar-powered (or, at least, lunar-inspired) supernatural mercenary on the hunt for Werewolf by Night (who had his own series back in Marvel’s supernatural heyday of the mid-70s). Despite his all-white costume, there were many clear parallels to Batman – from his cape and cowl to his tiny crescent-shaped boomerangs. Part of the character’s ongoing schtick is that out of his costume he lives a fractured life – posing as millionaire Steven Grant and cab driver Jake Lockley. He still retains his chauffeur from his soldier of fortune days (his version of Alfred), blurring the lines between man-about-town Grant and his own identity. Further blurring the lines, he dates his sometime-sidekick Marlene, the woman who allowed Khonshu to revive him, but she frequently appears at society events with Grant as part of his complex cover story. Things get a little more weird after Moench relinquishes the reigns. Moon Knight goes crazy trying to keep his multiple personalities straight. Then, Khonshu somehow steers him to join the West Coast Avengers before being exorcised by an unrelated seance. 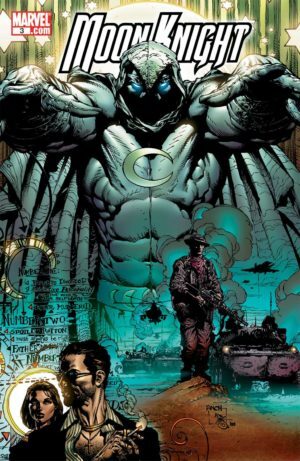 That leaves Moon Knight back on the streets of New York, where he eventually dies in 1994.
long the way, both Spector the character and we as readers have lost touch with who he really is, even as Moon Knight has been distilled into an even more iconic characrer. There are three spots where you can jump into Moon Knight. First, you could pick up his first Epic Collection and read him from the beginning. I’m not always in favor of starting with 70s-era comics, but Doug Moench’s writing absolutely holds up today and these are a real joy to read. The downside is that after the second Epic Collection you’ll be left stranded – we’re still waiting for a third, and there’s a gap of over 70 issue before you’ll hit any more collections. Second, you could begin with the 2006 series by Charles Huston. This is where I began, and I loved it. In retrospect, it’s pretty reverent of the early Moench material without getting too bogged down by it. However, this is getting a little hard to find – it might be best if you plan to read digitally. Third, you can start in 2014 with Warren Ellis’s much-lauded run on the character, followed by runs by Brian Wood and Cullen Bunn. While these comics occasionally reference Moon Knight’s history, they’re very stand-alone stories written very much in Moench’s original supernatural mold. Moon Knight is back in Marvel Legacy as penned by Say Anything frontman (and accomplished comics author) Max Bemis. The relaunched, renumbered run restarted with Moon Knight #188 just three weeks ago, and will run at least through #193. Prior to Legacy, Jeff Lemire’s run on Moon Knight wrapped up earlier this year, with his final collection out in September. Moon Knight didn’t make a single outside appearance during All-New All-Different Marvel, so there’s nowhere else to find him! However, after the end of the Lemire run, he pops up briefly in the dubiously canonical Deadpool Kills the Marvel Universe Again (2017). Why is there such a fierce drumbeat for Moon Knight to appear in Marvel’s Netflix Universe? It’s not just because he’s a street level hero. He was a major player in 2010’s Daredevil “Shadowland” story, which would stars the entirety of Marvel’s Netflix cast and could easily snap into the next season of Daredevil or a subsequent season of Defenders. Adding fuel to the speculative fire, we’re getting a single omnibus edition of the storyline (which is much better than most folks give it credit for) in February. Can’t wait that long? I cover Shadowland in my Guide to Marvel Events. Moon Knight was suffering from some major color gaps as of just a few years ago. Of his pre-2006 material, only his run in Hulk magazine had ever been collected comprehensively. His debut hadn’t even been reprinted! Marvel has remedied a big chunk of that with a pair of Epic Volumes, which put a 20% dent in the “In Color” column of this collected status chart. However, we still have no reprints of 1989’s Marc Spector: Moon Knight aside from a handful of tie-ins to line-wide events. That puts Moon Knight a little bit behind some of Marvel’s other marquee heroes, who tend to hover in the 70-80% range for their color collections. The gap is not all down to Moon Knight being a lesser-known character. His lack of a Silver Age run that could hit Marvel Masterworks robs him of a few-dozen issue boost in the standings from which most other long-running Marvel characters benefit. Plus, his longest-running series and two mini-series are from the period of 1989-2000, which Marvel has been slow to fill in with reprints save for its most-popular heroes. Still, 61% collected-in-color status is not terrible – especially considering it was more like 40% before we got a pair of Epic Collections! We’ll just have to keep our fingers crossed for a third Epic Collection in the latter half of 2018 to continue to fill the gap. Want to own all of the 61%? Head to the Guide to Moon Knight to learn how it’s all been collected and snag it for yourself, just like I did – along with all of his single issues along the way!